Created by Aaron Sorkin, this serial drama follows fictional U.S. President Josiah “Jed” Bartlet (Martin Sheen) and his White House staff through both routine days and days of personal and international crises. 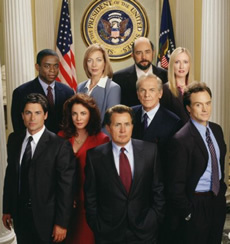 Initial series characters included Chief of Staff Leo McGarry (John Spencer), Deputy Chief of Staff Josh Lyman (Bradley Whitford), Communications Director Toby Ziegler (Richard Schiff), Deputy Communications Director Sam Seaborn (Rob Lowe), Press Secretary C.J. Cregg (Allison Janney), and Presidential Aide Charlie Young (Dule Hill). The series begins midway through Bartlet’s first year in office and ends at the completion of his second term. It’s inauguration day and a day of many transitions. Longtime workmates say goodbye to each other and their jobs while new staffers prepare to take their positions. In the last hours of his presidency, President Bartlet pardons Toby. By the end of the episode, President-Elect Santos (Jimmy Smits) is inaugurated and President Bartlet leaves office. Read the full description here. • The series had been slipping in the ratings for some time so it came as little shock when NBC cancelled The West Wing in January 2006. Thankfully, the cancellation notice came early enough to give the show’s creative team time to properly wrap the drama. Had the series continued, it would have likely followed a new administration. • Sorkin wrote almost every episode of the series for the first four years but his hectic writing schedule led to cost and schedule issues. He opted to leave the show after four seasons, following increasing personal problems including drug abuse. Sorkin made a cameo appearance in the series finale. • Spencer died unexpectedly from a heart attack on December 16, 2005, about a year after his character suffered a nearly fatal heart attack on the show. Leo McGarry’s death was first addressed in the episode “Election Day,” which aired on April 2, 2006. • The series received a total of 40 Emmy Awards during its run and was named Outstanding Drama Series four years in a row. Five actors each won single Emmys for their work on West Wing (Alda, Channing, Schiff, Spencer, and Whitford) while Janney won four. Sheen was nominated for each of the seven seasons but never won. • The series was originally going to center around Lowe’s character with the president in a mostly unseen role, likely in part due to the fact that Sheen had concerns about committing to a full-time role on a TV series. Sheen’s screen time gradually increased and this shift was one of the reasons for Lowe’s departure from the show in season four. Lowe returned to the series for a few of the final episodes when his character agreed to work for the incoming Santos administration.